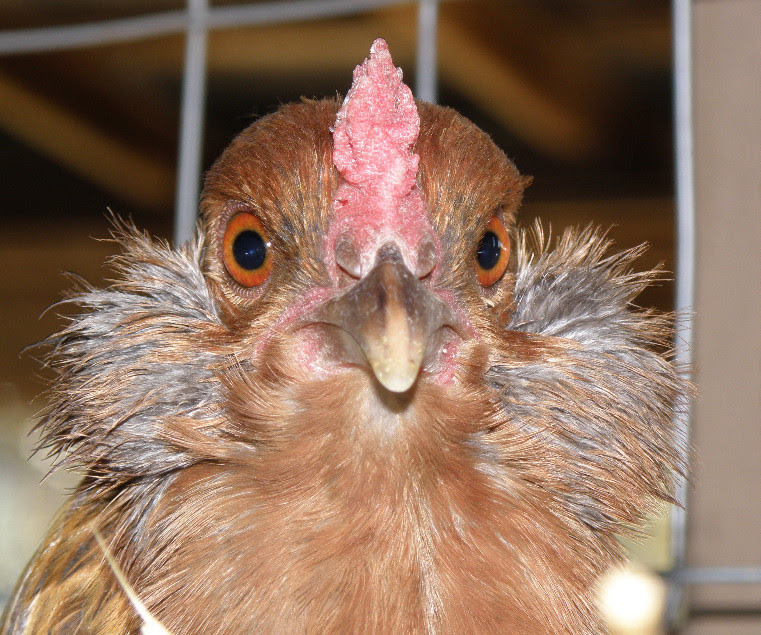 Come meet some local hens and learn the basics about these fun and rewarding pets. We will discuss how to buy chickens and how to care for them properly, including food, housing, and protection from predators. Instructor: Sara Braden & several visiting hens. Sara is co-founder and assistant farm manager of CommonWealth Urban Farms. During WWII, more than 12 million Victory Gardens were planted in cities across the country, and home gardeners produced a third of all vegetables consumed in the U.S. Today, urban farms, community gardens, and front yard and backyard gardens are all part of a fast-growing revival in growing food in cities across the country. Drop in anytime between 10 am and 1 pm for tours at both sites, located just 7 blocks apart. 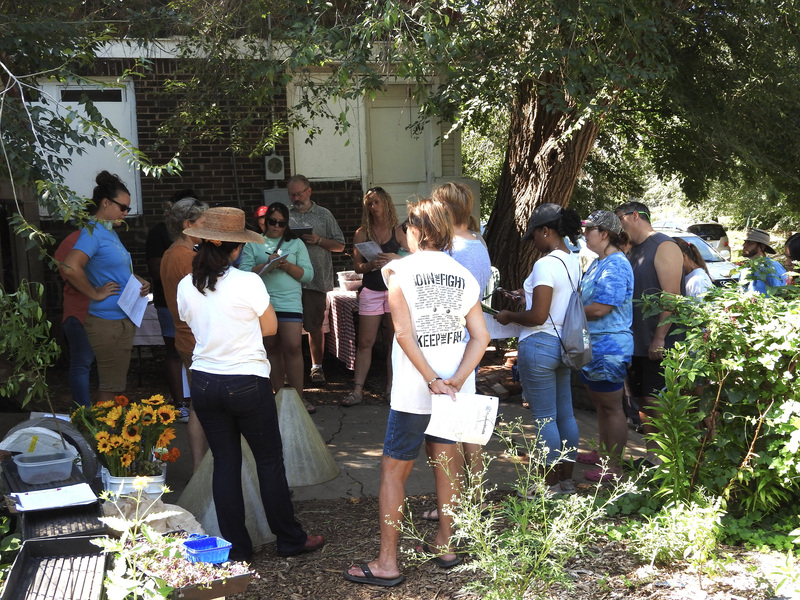 CommonWealth Urban Farms include vegetable gardens, cut flower garden, compost operation, hoop house, rainwater collection system, fledgling food forest, and neighbors’ front yard gardens. 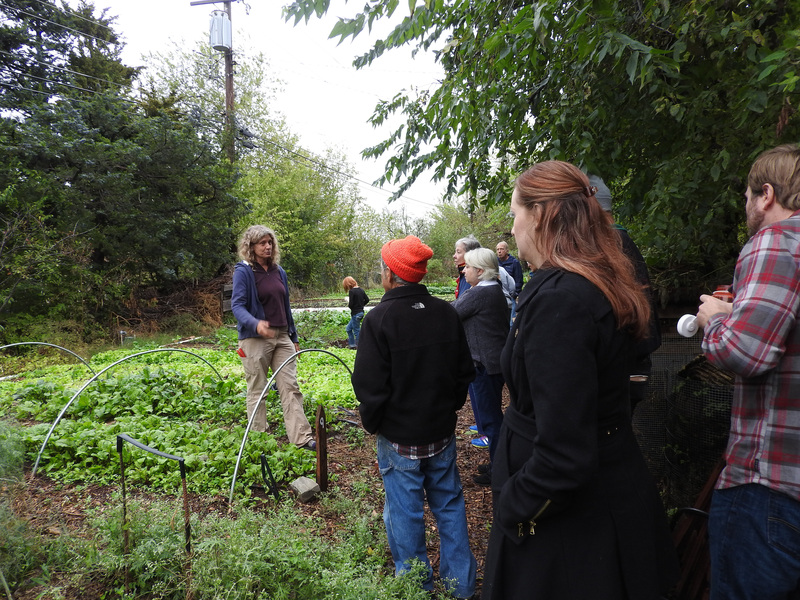 Tours of SixTwelve include the vegetable garden, rain garden, hoop house, mini orchard and community center. Plant Your Fall Garden Now! Fall is the easiest and most pleasurable time to garden in Oklahoma. With the heat of summer behind us (hopefully), the season is wide open for planting. If you’ve had trouble growing carrots successfully, here are my two tricks. Carrot seed is super picky about drying out, and it takes up to 2 weeks to germinate. That means watering those seeds EVERY day after you plant them—until you see the tiny green sprouts emerging from the soil. Also, carrots need a loose soil for their long roots to grow unimpeded; slide a garden fork into the soil every 10-12”, rocking it back and forth, to aerate and prepare the soil before seeding. You should see the new flower garden! There is nothing like a sea of flowers to make my heart leap. I can harvest flowers all morning, then come back 3 days laterand the garden is full of blooms all over again. And it’s not just us humans who are enjoying them! Bees and monarchs and all manner of tiny flying friends make the flower garden a lively place indeed. Do you need a gift for an upcoming birthday, anniversary or host gift? Why not put your gift-dollars to work doing good in your community? 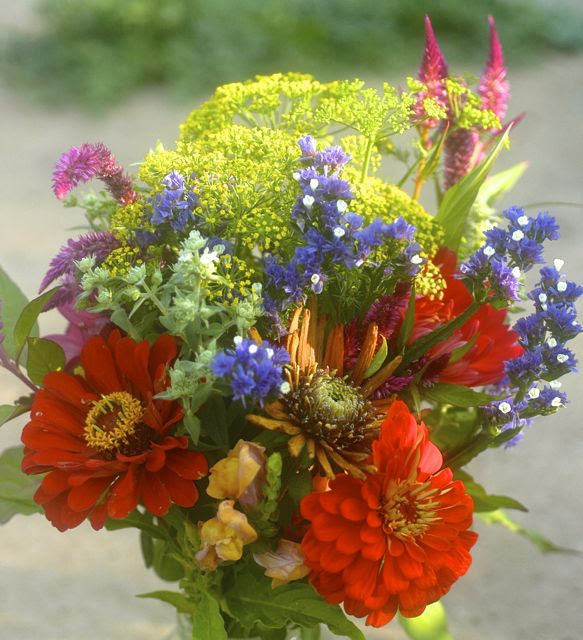 Commonwealth Urban Farms Slow Flowers bouquets are locally and sustainably grown. 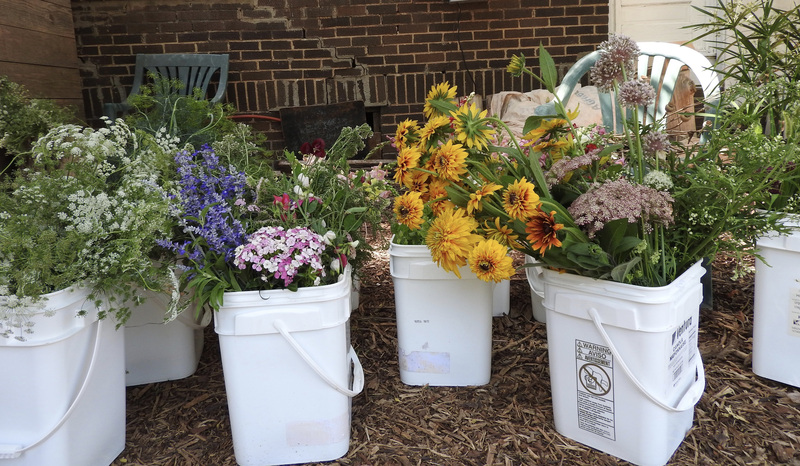 They provide abundant food and shelter for area pollinators, as well as food for the soul of the neighborhood. Click here to order your Slow Flowers! Well, it’s gone far. 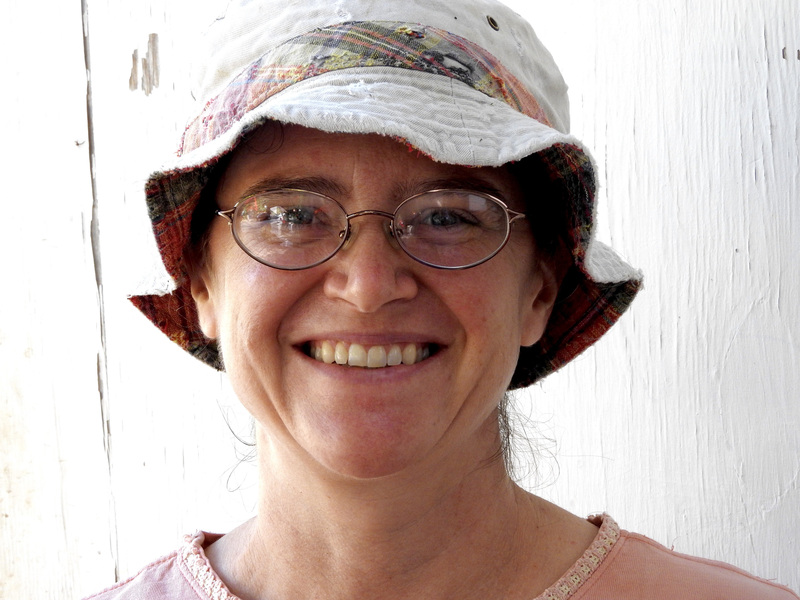 Sara became CommonWealth co-founder and assistant farm manager. She knows every inch, every seed, every leaf and every procedure in the vegetable operation. 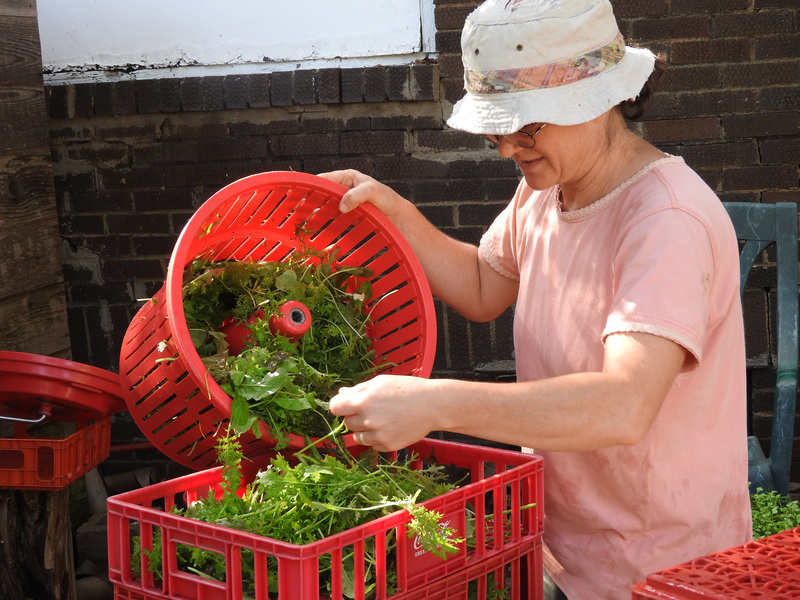 On Wednesdays, which is a harvest day, she often spends hours at the three sinks in the lean-to, washing and spinning the greens that are sold to restaurants and CSA members. On Saturdays, as manager of the CSA, she divides up the CSA portions for members, sets them out, greets and assists members as they pick up their orders. Her other days on the farm include pulling weeds, prepping beds, setting tomato cages and any number of tasks. Sara began her work alongside husband David in the composting operation and isn’t sure how she moved into the vegetable part of the farm. “I’m not a gardener,” she often reminds people. But she has a history of gardening—starting in Italy! She was there to study violin-making. While she did that, she lived in a house that had been damaged by earthquakes, working on the house, cooking for the owner and tending the garden. At the end of two years, she’d made a guitar rather than a violin. She and David moved to Oklahoma in 1998. David gardens at their home and Sara raises chickens. At CommonWealth, in addition to everything else, she has unofficially become responsible for keeping things light when the work tends toward intensity, and collects good jokes to share. Steadfastly claiming she isn’t a gardener, she continues to be CSA manager and a stellar veteran gardener, but has given up her staff position. Spider Wasps. Yeah. I said it. Spider Wasps. Take a moment to cringe and then read on. Spider wasps belong to the family Pompilidae in the Order Hymenoptera. Okay, so these guys are no joke. As you can see from the picture, they often take on prey just as large, if not larger than themselves. They do not kill their prey. Instead, the sting that they inflict paralyzes the spider and the wasp then transports it back to a nest. They usually have to drag the spider home, as often the spider is too big to carry in flight. I watched as this particular wasp dragged its spider the entire length of the 30-foot east-west wall of the Hoop House. Apparently some species of spider wasps actually bite off the legs of the spider, making it easier to transport, and then subsequently proceed to drink the blood that leaks from the wounds. Wow. That’s gnarly. The female wasp then lays a single egg on the alive-but-paralyzed spider and well, the rest is history. 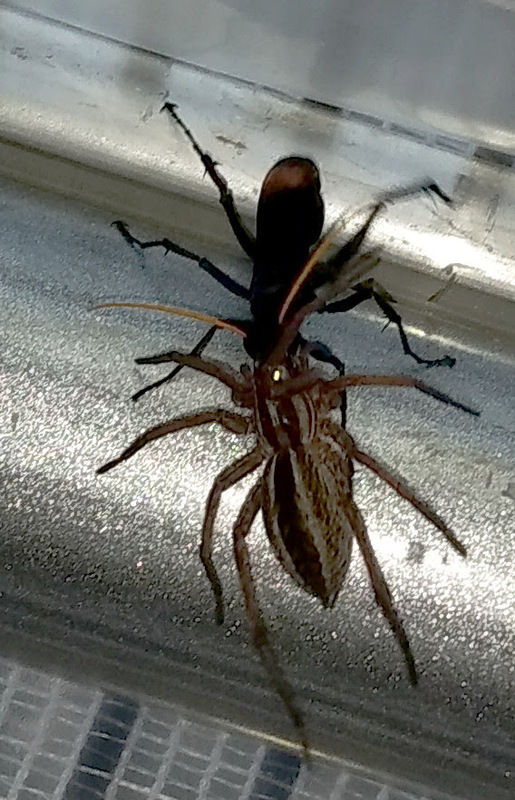 Most spider wasps are about ½-to-1 inch long, but some (like the well-known, and beautifully-colored, tarantula hawk) are larger than 2 inches in length. They generally have dark or black bodies and yellowish- or orange-colored wings. Most often they are found amidst the flowers…for a couple of hours…on a beautiful day… Or they are found running along or hovering above the ground in search of prey. Also, I imagine the following is probably a mute point but you should avoid directly disturbing spider wasps, as their stings are said to be exceptionally and excruciatingly painful.